The spotted hyena (Crocuta crocuta) is a family Hyaenidae mammal that's famously referred to as the "laughing hyena." This moniker is a nod to the animals' signature vocalization, which indeed is similar to an enthusiastically cackling human being. Although spotted hyenas are seriously tough predators, they occasionally are subject to predation themselves. Spotted hyenas, physically speaking, are vaguely reminiscent of wild dogs. Their fur usually is gray, yellow or beige, with scattered darker blotting that becomes less and less noticeable with aging. Males can weigh up to 138 pounds, while females can be as heavy as 165 pounds. The population of spotted hyenas is sizable, and they are fixtures all over Africa, from Kenya and the Sudan to Namibia and Botswana. Most members of this species survive for roughly 12 years, but some individuals exceed two decades. Spotted hyenas are some of the savviest carnivores around, and therefore they're too intimidating and strong to have a wide assortment of predators. However, they're not exempt from the dangers, particularly when it comes to lions, their major sustenance rivals and fellow carnivorees. Spotted hyenas usually are killed by lions due to battles over prey. Apart from lions, spotted hyenas are also occasionally shot to death by humans hunting game. Not only are spotted hyenas destroyed for their flesh, but also sometimes for medicinal purposes. 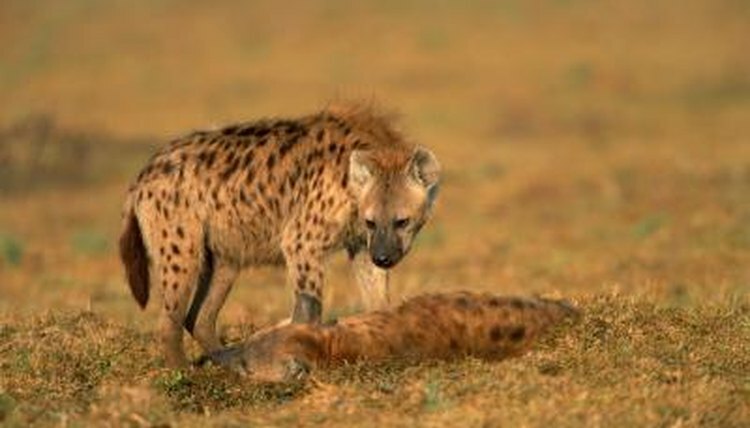 Occasional predation isn't the sole risk to spotted hyenas. Another prominent danger to the species is habitat ruination. The presence of livestock and the expansion of structures by people both contribute to lower populations of spotted hyenas. Both livestock grazing and significant structural expansion can drive away some of the spotted hyenas' favorite prey animals, which can in turn cause the big-time predators to have a lot less food to eat. These social creatures may indeed be the target of "once in a while" predation, but that in no way holds a candle to their own scavenging prowess. The spotted hyena diet entails meat -- and lots of it. Some of the species' diverse preferred meals are buffalo, zebras, puff adder snakes, wildebeests, porcupines, warthogs, jackals, hares, fish, birds, bird eggs, monkeys, foxes, termites and antelopes. Although spotted hyenas do consume a lot of prey animals that were previously killed by other creatures, they also do a fair amount of hunting, as well -- both independently and in groups. In any case, spotted hyenas are usually the predators, not the prey, luckily for them.